Only rarely do most of us find ourselves in the presence of brilliance. 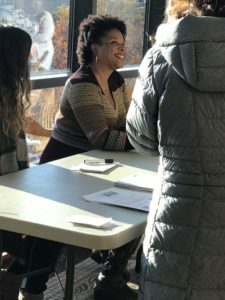 Last Sunday I was fortunate to attend a presentation by the brilliant Tayari Jones, author of four novels, including Silver Sparrow and the recent Oprah’s Book Club selection An American Marriage. Let me assure you she is equally gifted both behind the keyboard and in front of a crowd. She held us all spellbound from the time she started talking until the moderators sadly ended the talk. I was first impressed by Jones when I read her third novel, Silver Sparrow, about five years ago. Silver Sparrow is the touching story of two girls who share the same bigamist father, but when they meet, only one knows they are sisters. Jones handles the sensitive material with tenderness and insight, marking her as a writer who not only understands complex emotions but can convey them clearly and truthfully. Although I haven’t read An American Marriage yet, I have every reason to expect it’s equally excellent. If I’d known nothing about her or the new novel, I would have vowed to read it as soon as she finished speaking. The story of how it came to be written and published is almost novel-worthy in itself—or at least the way Jones told it—and is a lesson in inspiration and perseverance. For inspiration, Jones said she likes to write about everyday people who find themselves intersecting with a moment in history. And within that encounter, she looks for moral ambiguity, a situation in which both characters are right, but they disagree. She found the seeds of An American Marriage in a conversation she overheard at a mall between a man who apparently had been in prison and a woman who was probably the one he left behind. She also saw in the situation an opportunity to explore the shortcomings of the prison system in America. And so she began to write. She first wrote the entire novel from the woman’s point of view, but it didn’t feel finished. So she rewrote it from the man’s point of view. But in that version, the man felt overly symbolic. He couldn’t be himself because he was representing all black men. So she added another man to share that responsibility. Then she hit a wall 50 pages from the end, and couldn’t move forward for a year. Finally she realized the character who had been in prison had lost his citizenship in humanity. He thought he had lost so much from being incarcerated that he forgot he still had something to give to others. Altogether, it took her six years to write the novel. Years earlier, when she was writing Silver Sparrow, the publisher of her first two novels ended her contract, but she didn’t give up. She wrote Silver Sparrow, so she was ready when Judy Blume (yes, THE Judy Blume, whom she didn’t know at all) introduced her to someone from Algonquin Books, which is another story in itself, and Algonquin took a chance on her. Silver Sparrow sold well, and Algonquin was willing to give her the time she needed to write An American Marriage. I have to interject here that I have a very fond memory of Pearl Cleage. Some time ago, she accepted one of my short stories for her magazine Catalyst: A Magazine of Heart and Mind, and when I saw her at a signing for one of her books several years later, she actually remembered my story. I feel a kinship with Tayari Jones. We share a respect for Pearl Cleage; despite times when we have lived in other parts of the United States, our imaginations continue to live in the South; and we’re both interested in society’s collective understanding of gender, how boxed in by expectations both men and women can be. She explores gender in An American Marriage, and it’s a major theme in my novel, Surface and Shadow. I feel a kinship with Tayari Jones. I just wish I could write like her.